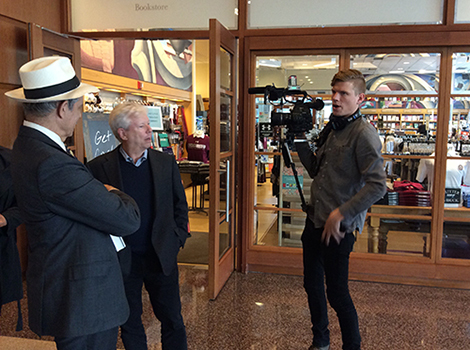 PBS Business and Economics Correspondent Paul Solman stands with Richard Thaler as they prepare to film a segment for PBS Frontline News Hour, at the University of Chicago Bookstore at the Gleacher Center. 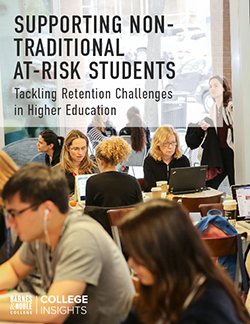 Located just off campus along the Chicago River and steps from the magnificent mile in downtown Chicago is The University of Chicago Bookstore at the Gleacher Center. In addition to housing the bookstore, the Gleacher Center is also home to the Booth School of Business evening and weekend MBA programs and executive classes. Not only is it a place for lectures, it is open for businesses to host events, corporate learning, meetings and of course, author events. Store Manager Kevin Bendle frequently works to promote events at the Booth School of Business as well as other departments across the University. The bookstore has played host to a variety of notable authors for book signings, including Steve Forbes, Editor-in-Chief of Forbes magazine; Harvey Mackay, businessman, author and syndicated columnist; Roger Lowenstein, financial journalist and author of The End of Wall Street; as well as the New York Times best-selling author of Freakonomics, Steven Levitt. 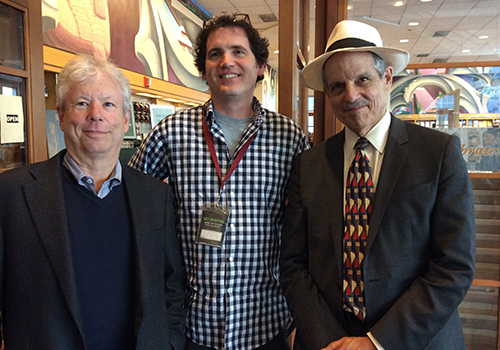 Professor Richard Thaler, Store Manager Kevin Bendle and PBS’s Paul Solman, pose in the Gleacher Center bookstore. Not only can a bookstore be a place to meet your favorite author when they come to town, but as is the case at the Gleacher Center, the bookstore was recently used as a taping location for a PBS Frontline News Hour segment that featured one of the University’s highly respected and beloved faculty, Richard Thaler, the Charles R. Walgreen Distinguished Service Professor of Behavioral Science and Economics at The University of Chicago Booth School of Business. Filming took place around campus as well as in the bookstore. When contacted by the PBS producers, Bendle partnered with the University to obtain the necessary approvals and readied the bookstore for the interview. Thaler spoke with PBS Business and Economics Correspondent Paul Solman about his new book, Misbehaving: the Making of Behavioral Economics. In it, Thaler uses humorous examples from every day life to describe how we don’t always act according to traditional economic theory – or in our own best interests when it comes to money. We tend, as Thaler demonstrates, to misbehave. While many professors from the school frequently do interviews, this was the first time filming took place in the Gleacher Center bookstore. “Wow, this is the best bookstore,” Thaler remarked during the interview, spotting two of his best selling books, Misbehaving and Nudge, prominently featured in the main floor lobby display, which is located at the entrance to the bookstore. He also pointed out the 30% off discount on his book, explaining his economic theory of how consumers are more likely to make a purchase – whether they need the item or not – if they believe they are getting a good deal.